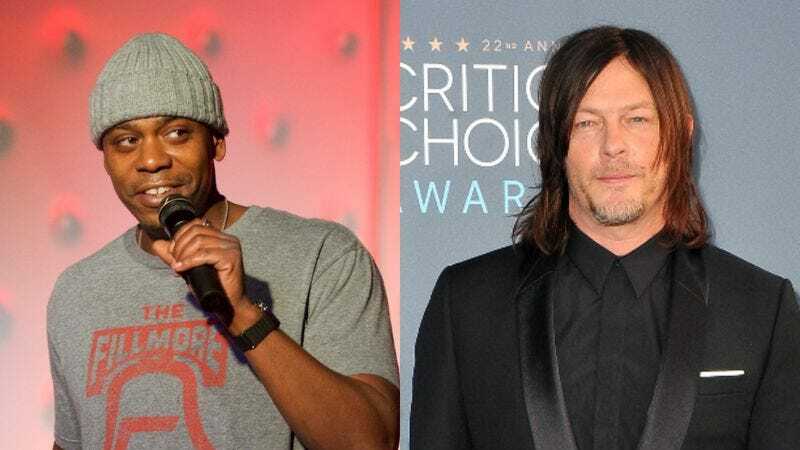 It seems like Dave Chappelle’s fondness for The Walking Dead goes beyond that memorable Saturday Night Live sketch, because the comedian will actually be appearing on an upcoming episode of Walking Dead actor Norman Reedus’ AMC series Ride With Norman Reedus. That show is currently filming its second season, and though we don’t know anything about Chappelle’s episode, it’ll presumably involve him riding motorcycles alongside Reedus while they talk about the cool bugs that got stuck in their teeth and and all the losers they saw driving cars—in other words, the stuff that all motorcycle people like to talk about. This comes from ComicBook.com, which also notes that an upcoming Ride With Norman Reedus episode will feature his current Walking Dead co-star Jeffrey Dean Morgan.